Gave this place a try and have a rather harsh review. First I love the location and the intimacy. Really a nice feel on a dark, typical Seattle December night. Staff was very nice. The pizza? Much to my disappointment was really bland. I make pizza's myself. And I love trying to take really cheap ingredients and make a za out of them that creates a mouthful of excitement. This place seemed like cheap ingredients with zero flavor. The crust, looked right, but was flavorless. The sauce? Couldn't taste it. Overwhelmed by the poor quality mozzarella. The pepperoni, ok, but washed out. The sausage, flavorless. Tutta Bella is one of my least favorite Neapolitan pie makers, but this thing didn't hold a candle to them. And to even say the word Delancey on the same page is just wrong. Very glad I went though. I recommend this place spends some time experimenting with fermentation times, perhaps invest in a good sourdough starter, and really start experimenting with ingredients and spices to make something that leaves you wanting more. @Anonymous: Thanks for checking out the site! I am surprised you found the pizza here bland, but to be honest I no longer live in Seattle and haven't been back to The Independent in at least two years, so perhaps they have declined in quality lately. On my last visit, however, they were using anything but cheap ingredients and there was lots of flavor in just about every pie. I'll have to make a return visit on a future trip to Seattle. 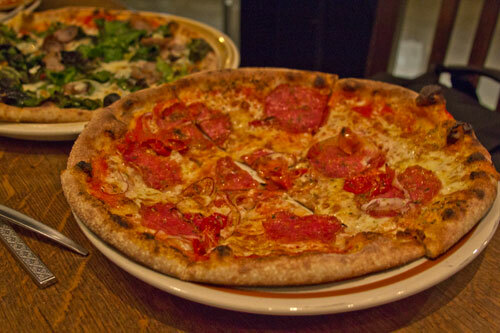 Out of curiosity, which pizza(s) did you try? Great site Adam! Just found it the other day. My sister and I were there and tried the State Fair and the Pepperoni. It surprised me as well Adam. I was really hoping to have found another great pizza joint. In fact I choose it over the Serious Pie based on reviews. (hadn't been to either place yet). Always possible I caught them on an off night. I feel bad being so harsh, thus why I offered some possible fixes. I'm looking forward to trying some places down in Portland. My daughter has some cheer comps coming up in the first half of 2013 and so looking forward to indulging in a few of the top places on your list. Oh, and tonight is pizza night in my house! Making my wife a white pizza tonight. She's tried to build one in the past, but no luck. So I'm challenging myself to make hers tonight. Wish me luck, I'll need it ;-).